Filipe, the weaver I met yesterday, picked me up in his car at 10am outside of the hostel. We headed for some of the well known sites in the valley. 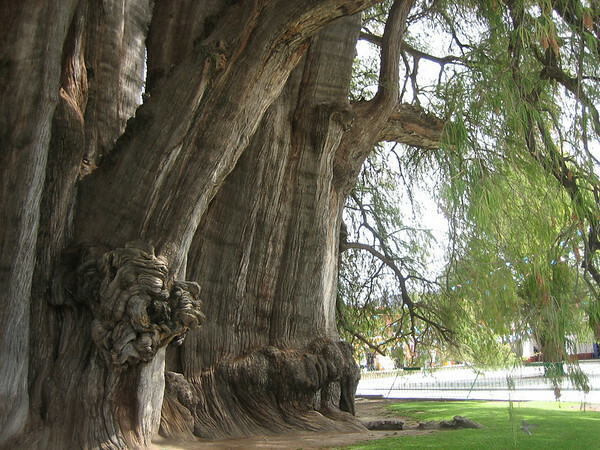 The first stop was at the “big tree” which is in fact a very very big and very old tree. It is not a tall tree but it is at least 25 feet wide at the bottom of the truck. While I was there I ran into the couple from Detroit that I had met in the taxi on the way into town. They were seeing the same sites on a tour. 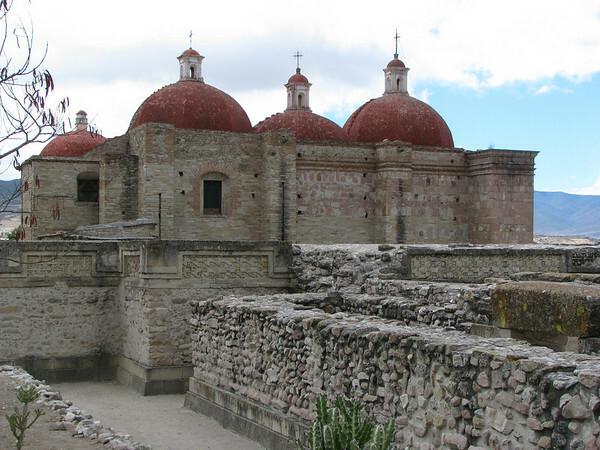 Our next stop was Mitla which is another Zapotec ruin. Mitla is a much smaller site that Monte Alban and much of the site was reused by the Spanish to build a church on the site. The best part of the ruins are some of the intricate stonework. The saddest part was that some of the painted stucco work had been marred by graffiti. 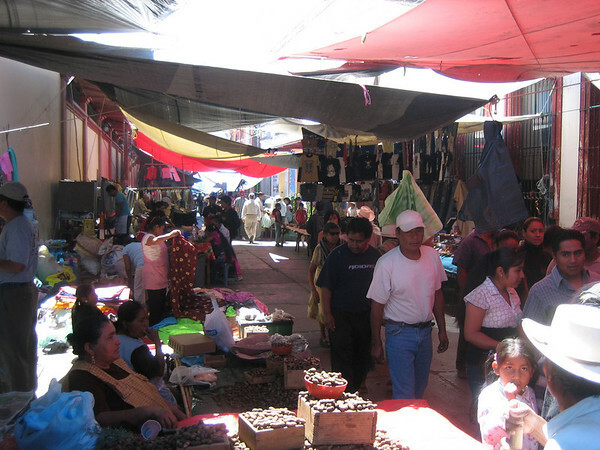 We then went to a large Sunday market at Tlacalula which is one of the largest markets in the area and was quite large. In addition to the usual collection of food and produce, it also had furniture and some wonderful crafts. I bought two necklaces and a bracelet for my wife and daughter for about 5 dollars total. 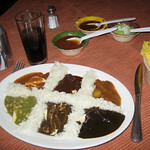 I did not really bargain, because why worry too much about saving a couple of pesos when the prices are already great. We then went to Felipe’s house where I met his son, daughter-in-law and grand daughter and got a demonstration on carting, spinning, dying and weaving wool. They use natural and traditional dyes. The rich red dye is made from an insect called a cochineal which lives on cactus. Dried and ground they become a red powder. I shot video of the process for a future video episode of the Amateur Traveler [Oaxaca, Mexico – Felipe the Weaver (part 1) – Video Episode 46]. I caught a bus back to Oaxaca. It dropped me off at the second class bus station. The first class bus station is new but the second class is a little more rustic. The parking lot is not even paved. I grabbed a quarter of a chicken and fixings from a pollo place near the bus station and took it back to the hostel. Nothing beats a good rotisserie chicken. I spent one last evening exploring Oaxaca before heading home. I was a little concerned that an ice cream stand was selling “tuna” ice cream (tuna in Mexico is a cactus fruit not a fish). 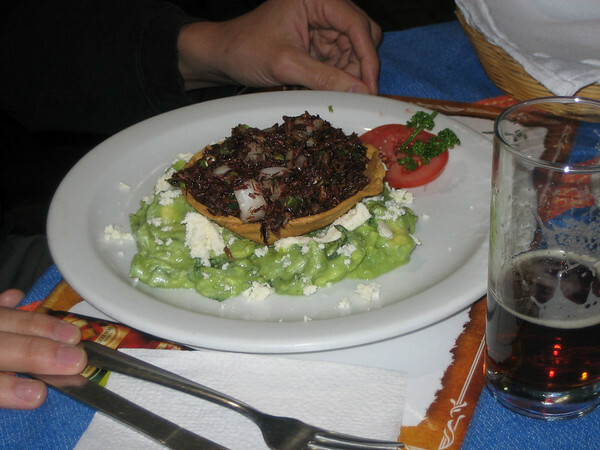 I ran into Backpacking Dave again (who I met at the Mexico City hostel) sitting in the zocalo with a plate of crickets (a traditional pre-columbian dish). Dave is backpacking around Mexico for 5 weeks in between jobs. We shared stories and he shared his crickets. They were a bit too spicy for him and a bit too insecty for me. This might cause by flickr third party apps delete permission. In different incident my flickr photo got deleted because I accidently remove it from my Adobe Lightroom’s flickr photostream section. It’s safe not to give delete permission to any flickr apps. Best suggestion yet. I have deleted the delete permission from iPhoto on my flickr account.